Heart wrenching sadness, it happens. Pain that feels unbearable and indescribably. So heavy that your chest might cave in. I felt all of this and more in the days, weeks, months, and now even over a year since our twin sons left their bodies at 20 weeks along in my pregnancy. Grief does not discriminate, it shows up when it needs to, however it needs to. 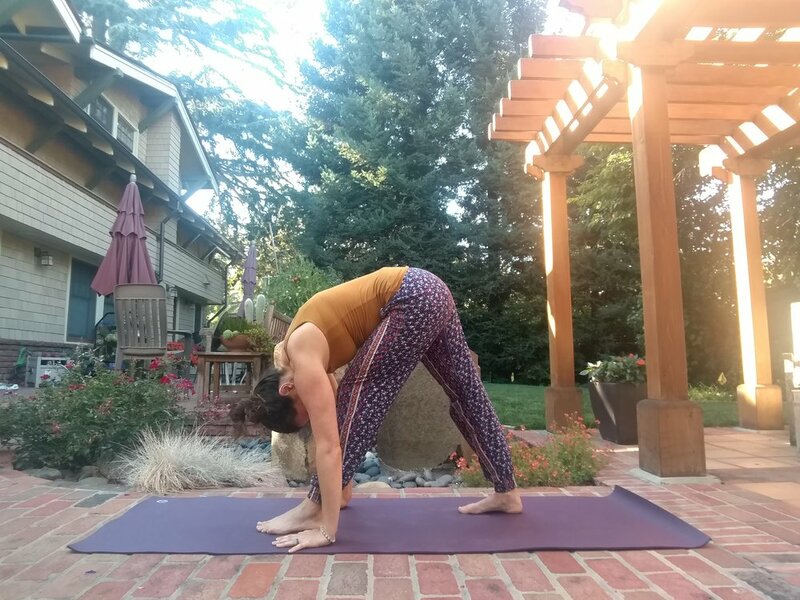 As I came back to my yoga practice, even after thinking I would never get on the mat again, these poses are the tried and true I kept coming back to. They felt nurturing. I felt like I was being held by a source greater than I could understand. 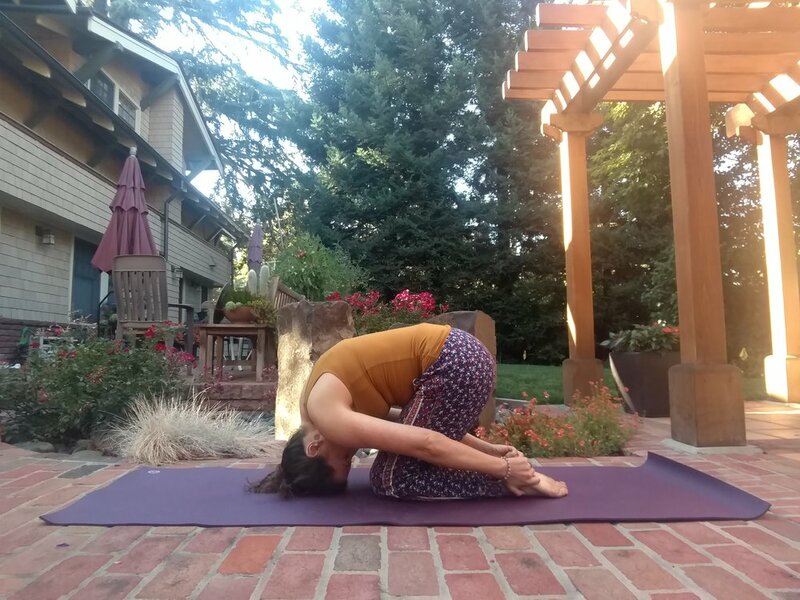 When your heart just can’t take it, unroll your mat, and as you connect to your breath and allow yourself to move, let the feelings flow. Cry. Scream. Yell. Pound the floor. Sob. Wail. The practice will allow you to burn through the feelings, to release, yield, embrace, or let go. Throughout this practice, maintain your breath. I will be writing the physical cues for each pose, so the breath is already a given. When you begin, establish a quiet, soft rhythm of the breath. Allow space for the inhale to be held in, and a pause after the exhale. Experiment, take a few short breath cycles and maybe a few long ones. Find a flow of breath that feels natural and effortless. Allow your breath to be the mover of your practice. Breath comes first, movement follows. If you lose your breath, come in to child’s pose or downward facing dog, or even seated easy pose, until you feel like you can establish a calm rhythm of the breath again. Come in to a child’s pose that feels good to you. Your arms can be extended or by your sides. Put a blanket under your knees if you need to for further support. Take as many breaths as you need here. Find your way from child’s pose to standing. Roll up slowly, taking your time. Then send weight into your heel, shift your hips back and bring your hands to your heart or arms overhead. Keep the spine neutral and lift the toes if you can. On my really sad days, arms overhead exposes the heart too much and brings on the tears, so this might be a safer option. Keep breathing and move on when you are ready. Step your right foot forward in to runner’s lunge, perch up on your fingertips and lengthen the spine and then step the back foot about halfway in. Spin the back toes out about 10 degrees. Make sure the feet are on railroad tracks so your hips have enough space to square off. Fold over the front leg, letting the head and arms totally relax. Bring your hands to your hips and turn to the direction away from the front foot. Parallel your feet and turn your toes slightly inward. 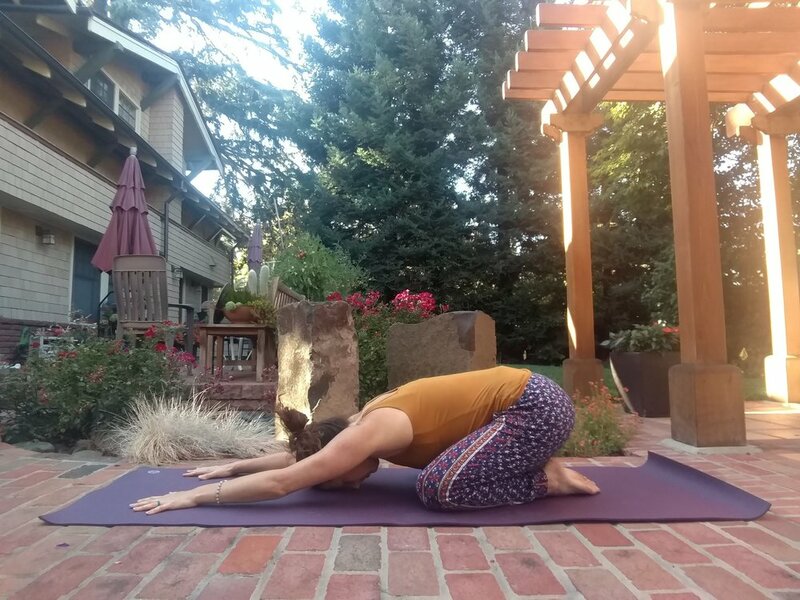 Lengthen the spine and take your time to fold forward, sending the tailbone back and up and bringing the crown of the head forward and down. Let your arms hand, or hook your toes and bend your elbows to assist you in folding deeper. After repeating the sequence on both sides, come to seated and extend the legs our long. Flex the ankles and sit tall. Extend the arms overhead and lengthen the sides of the body. Feel the front of the pelvic bone begin to tilt forward, as you come forward and down. Imagine the collarbones and chest lengthening towards the toes. Keep the low back long, tailbone extends behind you. Grab what you can, and soften the head and shoulders when you are ready. You can sit on a blanket to make this fold easier, or just sit up right if you feel you are too slouched over to fold with keeping the spine long. Rise up from the forward fold, press your knees together, and roll on to your back. Hug your knees in and extend your arms out in line with the head of the shoulders. Shift your hips slightly to the right and exhale as you lower your knees to the left for a twist. Let your gaze fall where it feels comfortable. Bend the knees deeply to 90 degrees and hold the outside edges of the feet with the hands. Ankles are flexed and toes pull towards the knees. Elbows are inside the knees and the wrist wraps outside the ankle to hold the foot, if you can. You can rock side to side, extend one leg or both, or do any subtle, calming movements here that feel good. Brings your arms by your sides and cup your heels or hold your ankles lightly. Lift your hips and roll on to the crown of your head. Let the legs support you here in rabbit pose. Stay here for 4-6 breaths. Dive down from chair pose and place your hands on the mat next to your feet. Bend your knees and step back, one foot at a time, and then lift the hips to downward facing dog. Fingers should be open wide, strong straight arms push the floor away, and tailbone lengthens to the sky. Press the heels down for a back of the legs stretch. You can also pedal the feet here and move around a bit. Breathe deeply. Rise up from pyramid stretch and step the back foot about 12 inches back. Line up the front heel to the back arch and extend the arms out in line with the head of the arm bones. Press the front knee open over the pinky toe of the front foot. Gaze over your front fingertips or close your eyes. Feet are rooted and legs are strong. Walk your hands to the top of the mat, step back to downward facing dog, and come in to child’s pose. Stay here as long as you need to, and when you are ready, stand and repeat the sequence from chair pose on the other side. Keep the breath easy and light, and take a rest whenever you need to. This is a deep practice to take you inward, so take all the time you need. Rise up from the forward fold, and bring the feet together while the knees splay out. Sit tall, hold on to the ankles or hold the feet like a book. You can even cup the fingers interlaced around the toes. Lengthen the spine more, feel the pelvic bone tilt forward as you fold. Think of the collarbones and chest reaching forward and down. Keep the chin neutral so the back of the neck is long and the cervical spine does not get compressed. Tailbone continues to lengthen behind you, as you soften the head and tops of the shoulders. Try not to overly round here, think low back long. 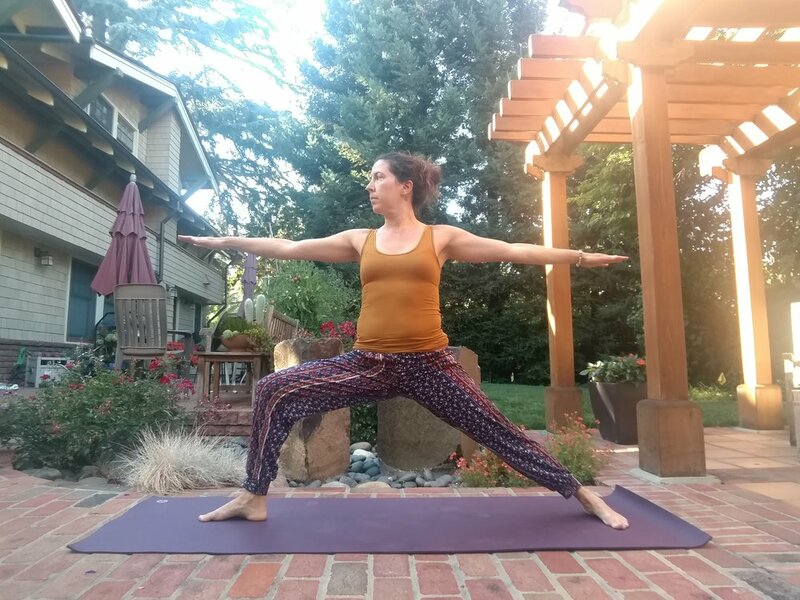 On an inhale, lift the knees up to neutral, hovering over the hips, shifts the hips to the left, and exhale as you lower your knees to the right. Let your neck twist to where it feels comfortable. Another option is to take the hand that is above the knees and rest it on the top knee. Come up on an inhale. Slowly release the feet and extend the legs long the length of the mat. If you are cold or want to get cozy, put on a sweatshirt, cover up with a blanket, use a blanket as a pillow, etc. You can also put a bolster under your knees if you have one. Extend your limbs and get completely comfortable. Close your eyes and take a few deep breaths, inhaling longer than you normally do, and exhaling every last drop of air out. Stay here and rest for 5-10 minutes. After savasana, slowly support yourself upright to seated. You might feel like spending a few minutes here in quiet seated meditation. Take it slowly for a little bit so that you don’t jolt your nervous system. You may even want to spend a few minutes journaling. 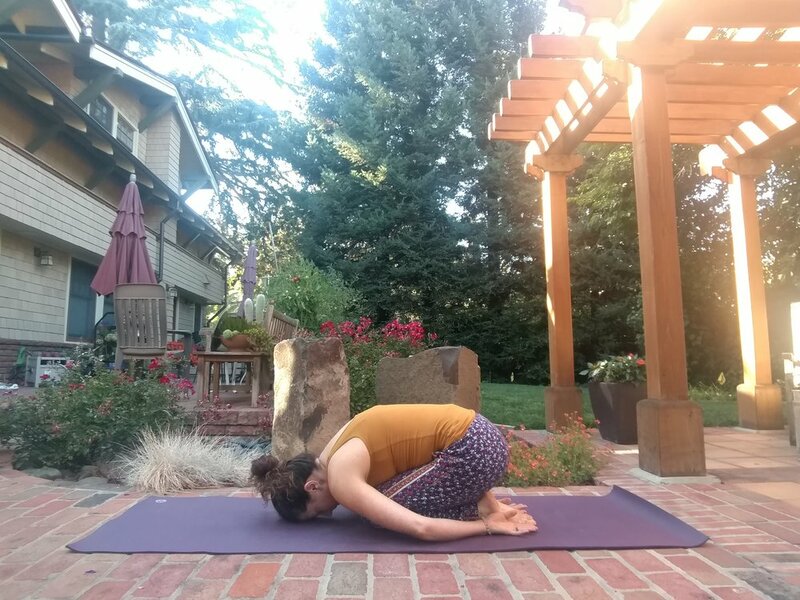 This forward fold practice is not necessarily calming, but it can be. It can be reducing, so if you are feeling agitated, overwhelmed, or restless, it may provide some relief. It can also make you sleepy or bring you down further, so just notice how you feel afterwards. You can always modify the practice to suit your needs. Yoga is personal, so let it be personal! This is your practice, and ultimately you are the teacher, so take your practice on a journey that feels right to you. If you have any questions about this practice, please let me know! I hope you enjoy it and give yourself the time and space to breath and move your body in a healing way.